The cornea is a transparent cover over the anterior part of the eye that serves several purposes, such as protection, refraction, and filtration of some ultraviolet light. This structure has no blood vessels and receives nutrients through tears as well as from the aqueous humor. The cornea is innervated primarily by the ophthalmic division of the trigeminal nerve and the oculomotor nerve. Although the exact frequency of emergency department visits for corneal abrasions is unknown, a 1985 survey showed that around 3% of all cases to US general practitioners were corneal abrasions. In addition, in 2008, approximately 27,450 work-related eye injuries and illnesses occurred that caused missed time from work. See the following image. 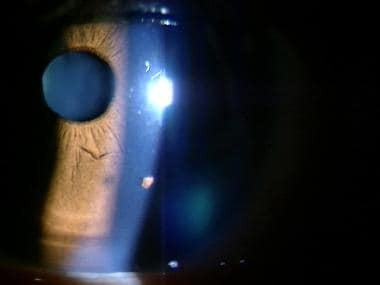 Corneal foreign body with cobalt blue lighting showing an abrasion. Patients with corneal abrasions are managed on an outpatient basis. Emergent ophthalmologic consultation is warranted for suspected retained intraocular foreign bodies. Urgent consultation is needed for suspected corneal ulcerations (microbial keratitis) (see the image below). Eye pain (occasionally severe), tearing, and foreign-body sensation are present. Patients sometimes complain of a foreign body sensation while keeping the affected eye shut. Other symptoms include photophobia, pain with extraocular movement, tearing, or blurred vision. A history of blunt or sharp trauma can usually be elicited. Include a detailed history with questions regarding recent sports activities, makeup application, excessive rubbing of the eyes, use of contact lenses (including poorly fitting lenses and duration of use), and motor vehicle accidents. Note the occupation of the patient, because certain people exposed to metals may have penetrating globe injuries. The eyes should be opened with the lids retracted to get a full look at the cornea as well as the conjunctiva. Assess the extraocular movements and the pupillary reflex. Occasionally, the patient may have a reactive miosis. If there is any history or signs of globe injury with violation of ocular contents, a plastic or metal shield should be placed, and an ophthalmologist should be called urgently. Assess visual acuity. If the abrasion affects the visual axis, then there may be a deficit in acuity that should be apparent when compared to the uninjured eye. Perform a visual inspection for foreign objects (see the image below). Both upper and lower eyelids should be flipped in order to look for foreign bodies that may be lodged in the upper eyelid, causing injury with eye blinking. The cornea can become hazy if there is edema due to the abrasion. Conjunctival injection usually located near the limbus may also be present. Tetanus prophylaxis, eye patching, and antimicrobial therapy for patients with corneal abrasions who present to the emergency department (ED) are reviewed below. In addition, foreign body removal is briefly discussed. See also Corneal Abrasion and Corneal Ulceration and Ulcerative Keratitis in Emergency Medicine. Tetanus associated with corneal injuries may rarely occur. Follow the Centers for Disease Control and Prevention (CDC) guidelines for tetanus toxoid (Td for adults, DT for children < 7 y) and tetanus immunoglobulin (TIG). Corneal injuries produced by organic matter or dirt, as well as those associated with tissue necrosis and with entrance of dirt or organic material into the conjunctival sac, should be considered dirty (ie, tetanus-prone) injuries and require boosters within 5 years. Previously, corneal abrasions were patched with the thought that a patch would promote healing and epithelial proliferation and cause less pain. However, multiple trials have shown that this practice not only has no benefit but also that eye patches may result in a loss of binocular vision, which can lead to further traumatic injury and patient disability. A meta-analysis of 7 trials in patients with corneal abrasion showed similar healing rates between patching and no patching. Six studies evaluated pain and found no difference in 4 studies, whereas 2 studies favored not patching. In addition, no differences in complication rates were noted between the patched and nonpatched groups. The investigators noted that eye patching did not improve healing rates or reduce pain and recommended no intervention when treating corneal abrasions due to the possible loss of binocular vision and possible increased pain. Antibiotics have been a mainstay of treatment although there is not strong evidence in favor of their use. The general principle has been to avoid superinfection of the abrasion. A non-placebo-controlled prospective cohort study showed that the use of 1% chloramphenicol ointment led to a lower rate of corneal ulceration. Another trial looking at fusidic acid eye drops did not improve corneal abrasion healing rates when compared to chloramphenicol ointment. The decision to use prophylactic antibiotics should be made by each treating clinician. If antibiotics are to be used, then an ointment is preferred to drops as it acts a lubricant. Choices include erythromycin or sulfacetamide ointment 4 times daily for 3-5 days. Patients who wear contact lenses are at risk of pseudomonal infection and should receive antibiotics (eg, ciprofloxacin, gentamicin, or ofloxacin) accordingly. The patient should be advised to not use contact lenses until the abrasion has healed and the patient has been reevaluated by an ophthalmologist. Identify corneal ulceration and treat with appropriate antibiotics. Consider the possibility of an intraocular foreign body or ocular perforation if history warrants (eg, string trimmer use, metal-on-metal hammering). Do not remove perforating foreign bodies, and limit the patient's vomiting if possible. Nonperforating foreign bodies should be removed using either irrigation or a cotton-tipped swab. If this method does not work, then—while stabilizing the head to avoid patient movement during the procedure— a 25- to 26-gauge needle can be used parallel to the eye. If the foreign object cannot be removed, the patient should be seen by an ophthalmologist within 24 hours. See the following images. 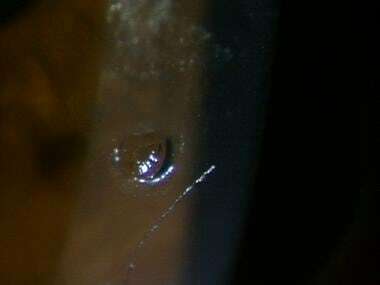 Corneal foreign body after removal. Patients with rust rings after metallic object removal should be treated as patients with corneal abrasions. Usually, these rust rings can be removed later. See also Corneal Foreign Body Removal and Intraocular Foreign Body. Topical antibiotics are often used to treat corneal abrasions, although the routine use of these agents for such injuries remains controversial. Many emergency physicians have stopped using topical antibiotics for minor injuries, although others continue treating corneal abrasions with broad-spectrum antibiotic ointments for infection prophylaxis and lubrication. Antibiotic use persists despite unproved efficacy and evidence that ointments may retard corneal epithelial healing. For large or dirty abrasions, many practitioners prescribe broad-spectrum antibiotic drops, such as trimethoprim/polymyxin B (Polytrim) or sulfacetamide sodium (Sulamyd, Bleph-10), which are inexpensive and least likely to cause any complications. Alternative agents are an aminoglycoside or a fluoroquinolone. Contact lens-associated abrasions warrant antibiotic treatment due to their propensity for developing infectious corneal ulcers (microbial keratitis). Coverage for gram-negative organisms (especially pseudomonas) is recommended with agents such as gentamicin (Garamycin), tobramycin (Tobrex), norfloxacin (Chibroxin), or ciprofloxacin (Ciloxan). Antibiotic drops are more comfortable than ointments but must be administered every 2-3 hours. Ointments that retain their antibacterial effect longer can be used less often (every 4-6 h) but are more uncomfortable due to visual blurring. Avoid antibiotics containing neomycin (eg, Neosporin) because of the higher incidence of allergy to neomycin in the general population. Topical anesthetic agents are used for analgesia to facilitate an adequate ophthalmologic examination. Traditionally, these agents have never been prescribed for home use, because they may cause a secondary keratitis, compromise epithelial wound healing, and block effective corneal protective reflexes and sensation. Although a recent study found the use of topical tetracaine for 24 hours in corneal abrasions to be safe,  there was no significant difference in corneal healing at a repeat examination within 48 hours. Nevertheless, this particular study excluded patients with large or complicated abrasions or penetrating eye injuries. Dilute proparacaine is another alternative for pain control in corneal abrasions using clinical discretion. Ball et al studied the use of dilute proparacaine for acute pain due to corneal abrasions and reported a rapid decrease in pain symptoms in patients given proparacaine without causing delayed healing. However, the study was flawed in that it did not adhere to intention-to-treat analysis and the size of the study was small. Moreover, the severity of the corneal abrasions studied was unclear, and most patients only used the pain medication within the first 24 hours. In general, topical anesthetics such as proparacaine and tetracaine should be prescribed with extreme caution until more information is available regarding their long-term safety. Topical nonsteroidal anti-inflammatory drugs (NSAIDs) have been found to be useful in reducing pain. A systematic review and meta-analysis showed that topical NSAIDs were effective as analgesics for traumatic corneal abrasions. Also, patients were more likely to take fewer oral analgesics and return to work earlier. The most common adverse reactions to these medications include stinging or burning and hyperemia of the conjunctiva. If these medications are prescribed, they should be be used for only 24-48 hours, and patients should be referred for follow-up to evaluate for signs of healing. Some ophthalmologists advocate for diclofenac (Voltaren) or ketorolac (Acular) drops and a disposable soft contact lens to be used in addition to antibiotic drops. This therapy may prove to be an effective alternative to patching, permitting the patient to maintain binocular vision during treatment. Compared with patching, the contact lens used with the NSAID may reduce pain. All but the most minor abrasions usually require a strong oral narcotic analgesic. Oral analgesics, such as codeine/acetaminophen (Tylenol #3) or oxycodone/acetaminophen (Percocet), may be indicated as an adjunct to topical treatments. These oral medications may help the patient get rest, to stop rubbing the affected eye, and to allow for healing to occur. No clinical trials that directly look at oral pain medications are available. Pain relief is the main goal, and a case-by-case clinical decision needs to be made in order to guide possible oral therapy. No good evidence exists in the literature to support the common practice of using cycloplegics/mydriatics for the treatment of routine corneal abrasions. In the past, it was thought that mydriatic medications ease spasm of the ciliary muscle in patients with corneal abrasions. Most ophthalmologists believe that the instillation of a long-acting cycloplegic agent can provide significant relief in patients who have extensive corneal abrasions, a large degree of photophobia, and blepharospasm. These agents relax any ciliary muscle spasm that may cause a deep, aching pain and photophobia. Occasionally, medications such as cyclopentolate (Cyclogyl) or homatropine have been prescribed. A recent trial looked at homatropine versus placebo to control pain in patients with corneal abrasions using a visual analog pain score. Although this was a small trial with only 20 patients in each treatment group, no significant difference in pain score reduction was found between the groups. Cycloplegic agents are mydriatics; thus, to prevent an acute angle-closure attack, ensure that the patient does not have narrow-angle glaucoma. The patient with a corneal abrasion should be seen by an ophthalmologist within 24-48 hours following discharge from the emergency department to assess for healing. Usually, these injuries heal quickly within 24 hours, and patients will not need long-term follow-up. Patients with contact lens–associated abrasions or large abrasions may need to follow up over the course of 3-5 days to ensure healing and avoid infection. Advise eye rest (ie, no reading or work that requires significant eye movement that might interfere with reepithelialization) and avoidance of light (or advice wearing sunglasses for comfort) if significant photophobia exists. Antibiotics should be continued until the patient is asymptomatic. In addition, narcotic analgesics (eg, oxycodone, hydrocodone) are frequently needed for severe pain, until the pain can be managed with over-the-counter analgesics. Cycloplegics may be required twice a day for large abrasions in patients with significant photophobia, blepharospasm, or both, until healing is nearly complete. Some evidence has shown that 0.3% sodium hyaluronate eye drops, as well as recombinant bovine fibroblast growth factor (rb-bFGF), may aid healing in corneal abrasions and prevent some of the complications such as corneal ulcer development. More research needs to be done prior to recommending these medications. Shields T, Sloane PD. A comparison of eye problems in primary care and ophthalmology practices. Fam Med. 1991 Sep-Oct. 23(7):544-6. [Medline]. Harris PM. Bureau of Labor Statistics. Nonfatal occupational injuries involving the eyes, 2002. Available at http://www.bls.gov/opub/cwc/sh20040624ar01p1.htm.. Accessed: April 10, 2009. Peyman GA, Rahimy MH, Fernandes ML. Effects of morphine on corneal sensitivity and epithelial wound healing: implications for topical ophthalmic analgesia. Br J Ophthalmol. 1994 Feb. 78(2):138-41. [Medline]. Flynn CA, D'Amico F, Smith G. Should we patch corneal abrasions? A meta-analysis. 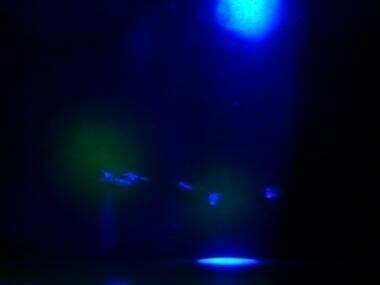 J Fam Pract. 1998 Oct. 47(4):264-70. [Medline]. Le Sage N, Verreault R, Rochette L. Efficacy of eye patching for traumatic corneal abrasions: a controlled clinical trial. Ann Emerg Med. 2001 Aug. 38(2):129-34. [Medline]. Turner A, Rabiu M. Patching for corneal abrasion. Cochrane Database Syst Rev. Apr 19 2006. (2):CD004764. [Medline]. Upadhyay MP, Karmacharya PC, Koirala S, Shah DN, Shakya S, Shrestha JK, et al. The Bhaktapur eye study: ocular trauma and antibiotic prophylaxis for the prevention of corneal ulceration in Nepal. Br J Ophthalmol. 2001 Apr. 85(4):388-92. [Medline]. Boberg-Ans G, Nissen KR. Comparison of Fucithalmic viscous eye drops and Chloramphenicol eye ointment as a single treatment in corneal abrasion. Acta Ophthalmol Scand. 1998 Feb. 76(1):108-11. [Medline]. Schein OD. Contact lens abrasions and the nonophthalmologist. Am J Emerg Med. 1993 Nov. 11(6):606-8. [Medline]. Waldman N, Densie IK, Herbison P. Topical tetracaine used for 24 hours is safe and rated highly effective by patients for the treatment of pain caused by corneal abrasions: a double-blind, randomized clinical trial. Acad Emerg Med. 2014 Apr. 21(4):374-82. [Medline]. Ball IM, Seabrook J, Desai N, Allen L, Anderson S. Dilute proparacaine for the management of acute corneal injuries in the emergency department. CJEM. 2010 Sep. 12(5):389-96. [Medline]. Calder LA, Balasubramanian S, Fergusson D. Topical nonsteroidal anti-inflammatory drugs for corneal abrasions: meta-analysis of randomized trials. Acad Emerg Med. 2005 May. 12(5):467-73. [Medline]. Carley F, Carley S. Towards evidence based emergency medicine: best BETs from the Manchester Royal Infirmary. 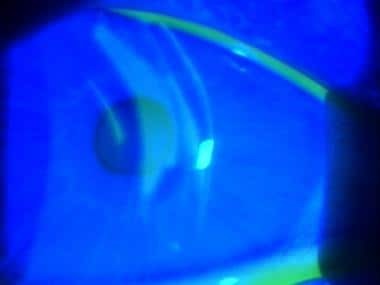 Mydriatics in corneal abrasion. Emerg Med J. 2001 Jul. 18(4):273. [Medline]. Meek R, Sullivan A, Favilla M, Larmour I, Guastalegname S. Is homatropine 5% effective in reducing pain associated with corneal abrasion when compared with placebo? A randomized controlled trial. Emerg Med Australas. 2010 Dec. 22(6):507-13. [Medline]. Lin T, Gong L. Sodium hyaluronate eye drops treatment for superficial corneal abrasion caused by mechanical damage: a randomized clinical trial in the People's Republic of China. Drug Des Devel Ther. 2015. 9:687-94. [Medline]. Dargin JM, Lowenstein RA. The painful eye. Emerg Med Clin North Am. 2008 Feb. 26(1):199-216, viii. [Medline]. Thyagarajan SK, Sharma V, Austin S, Lasoye T, Hunter P. An audit of corneal abrasion management following the introduction of local guidelines in an accident and emergency department. Emerg Med J. Jul 2006. 23(7):526-9. [Medline]. The authors and editors of Medscape Reference gratefully acknowledge the contributions of previous author Robert M Howell, MD, and Samala Khan, OD,to the development and writing of the source article.